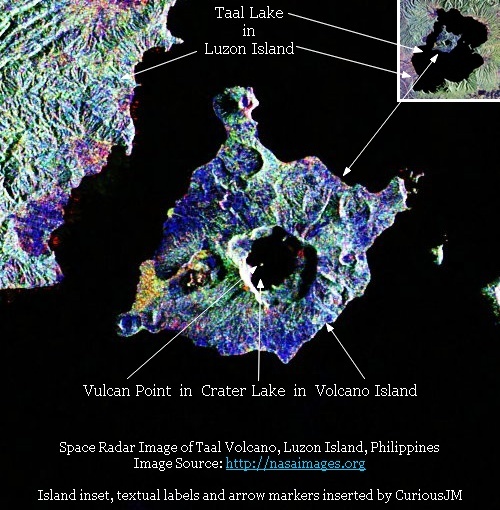 located in - Taal Caldera on Luzon Island, Philippines. 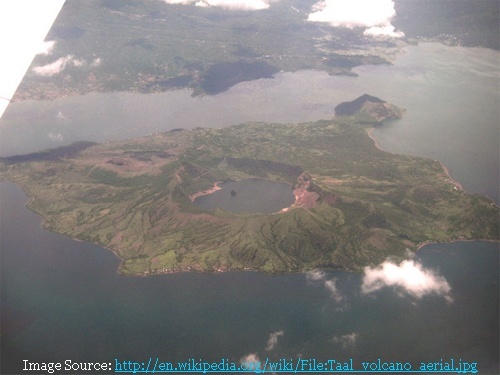 Here is another image which shows Vulcan Point, Crater Lake, Volcano Island, Taal Lake and Taal Caldera (a cauldron-like volcanic feature usually formed by the collapse of land following a volcanic eruption). View location in Google Earth Google Maps. (It is the small white blob in black lake). Back in 1979 or 80, I took a dip in Crater Lake and came out covered by a slimy "coat" of sulphur-saturated water. Volcanoes abound in sulphur. During eruptions, volcanic dioxide is expelled into the atmosphere in enormous amounts. Sorry to disappoint, but the World's Largest Island-in-a-lake-on-an-island-in-a-lake-on-an-island is actually llocated on/in Victoria Island in Canada's Northwest Territories. Thank you Dan for the information. I will update my blog shortly about this recent discovery.